At the unveiling of Pokkiri Raja’s latest song, Hansika was seen in a Neha Taneja dress, one that she wore with simple Burberry t-strap sandals. Hair worn sideswept, her look was finished out with simple jewellery. Given that exaggerated bow detail, it was a good move that the styling was kept simple. She looked nice. Hansika was seen in an all black outfit at the promotions of Aranmanai 2 on Tuesday that included a sheer sleeved Aruni Blazer, Bebe pants and a Zara top. Earrings from House of Shikha and a pair of black platform pumps finished out her look. Like her head to toe black look? At the Filmfare Awards, Huma opted for a one-shouldered Mayyur Girotra gown featuring the designer’s signature floral embroidery. Hair in a ponytail, her look was finished out with a pink lip and a serpent cuff and ring, both Farah Khan Fine Jewellery. I didn’t care for visible clips but the hairdo itself and the pink lip was quite unexpected. Overall, I found myself quite liking it. 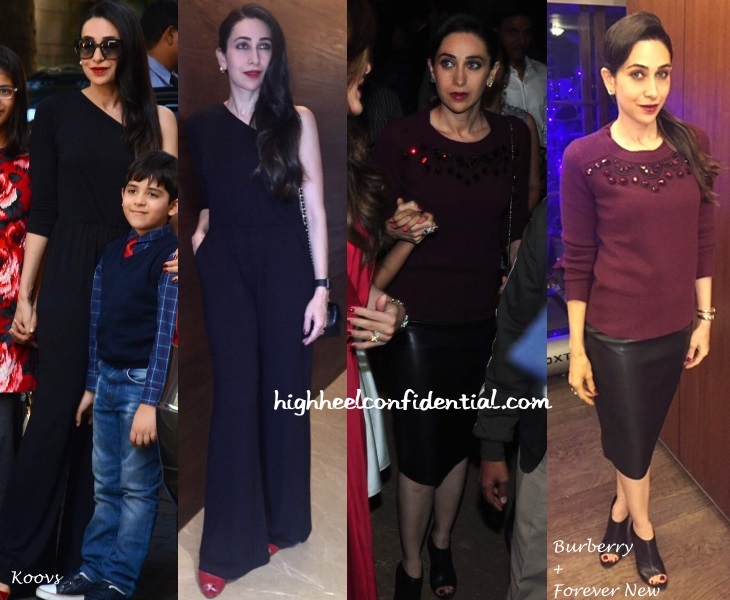 Christmas festivities for Karisma began with her attending Mass in a burgundy Burberry sweater that was paired with black Forever New pencil skirt. For Christmas lunch with the family, she wore a one-shouldered Koovs jumpsuit with red Choo pumps and a red lip. Which of the two looks did you prefer? For promotions of a paint brand, Surveen visited several cities and sporting mostly Zara to them. For us, though, the Pankaj & Nidhi looks were the ones that stood out more. Which ones did for you?